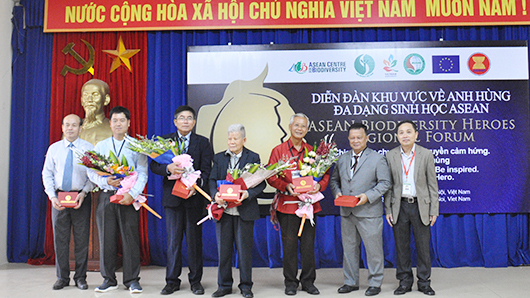 (VACNE) - The representative of Vietnam is Prof. Dr. Dang Huy Huynh, Vice President of the Vietnam association for Conservation of Nature and Environment (VACNE), former Director of the Institute of Ecology andBiological Resources, Chairman of the Vietnam Zoology Association. From March 26-27, Ministry of Natural Resources and Environment (MONRE) coordinated with the ASEAN Center forBiodiversity (ACB) and Hanoi University of Natural Resources and Environment under MONRE to host the ASEAN Biodiversity HeroesRegional Forum. In order to sustain the achievements, this forum included a series of three regional Biodiversity Heroes forums to attract key individuals and organizations from different sectors - media, universities, academic research institutions, government agencies, private organizations, and young people who join hands to protect biodiversity. The ASEAN Biodiversity HeroesRegional Forum makes an important contribution to raise awareness among young people not only in Vietnam but also ASEAN countries on the important role of biodiversity. The stories and messages that Heroes brings to this forum will be inspirations to spread the spirit and responsibility of human to nature. At the forum, Biodiversity heroes from Laos, Myanmar, Thailand and Vietnamshared stories about theirway to biodiversity as well as conservation initiatives and experiences. They not only contribute to the achievement of the country's sustainable development goals, but will have initiatives to preserve the ASEAN's biodiversityand thus contributing to sustainable development in the region. The representative of Vietnam is Prof. Dr. Dang Huy Huynh, former Director of the Institute of Ecology andBiological Resources, Chairman of the Vietnam Zoology Association, Vice President of the Vietnam association for Conservation of Nature and Environment. He is one of ten outstanding individuals from 10 ASEAN countries who honored to receive this noble title. He has studied the status of biodiversity resources of various ecosystems of biodiversity as well as the protection measures not only for Vietnam but also for Indochina and ASEAN countries. In addition, he also organizes the establishment of heritage trees and provides trainingsforstaffs and youth scientists to participate in biodiversity conservation. At this forum, the Director of ACB Roberto V. Oliva called: "I also challenge you, are you dare to be part of a new generation who equipped with knowledge toplay the role ofa messenger of changes for the purpose of biodiversity conservation?"